Born Giovanni Battista Moroni to the architect, Andrea Moroni, the painter was also called, Giambattista Moroni. Working in the Italian Mannerist style, Moroni became known as one of the best known portraitist of the 16th Century, as well as painting religious subjects. Training under the religious painter from Brescia, Alessandro Bonvicino, called Il Moretto da Brescia (1498 – 1554); he may have also studied some with the Venetian, Titian (1485 – 1576). 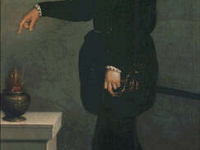 Moroni’s exposure to Titian came during his time in Trento, where he was often commissioned for portraits when Titian could not be obtained for the work. While not reaching the mastery of the great Titian, Moroni’s portraits were far greater than his own religious works. His portrait style would go on to influence the work of the Bergamese painter, Frá Galgario (1655 – 1743) and the well known Venetian, Pietro Longhi (1701 – 1785). They are highly individualized, personal depictions that seem to envelope the very essence of his subject in a sophisticated and venerable light. He worked primarily in Albino, in the province of Bergamo in Lombardy. Some of his religious works were painted for the Verona Cathedral, the Sant’Alessandro della Croce, and his unfinished piece in the Church of Gorlago in Bergamo. Some of his best know portraits are in the Uffizi Gallery, including Portrait of Pietro secco Suardo, Portrait of a Man with a Book, and Portrait of the Poet Giovanni Antonio Pantera, as well as in the National Gallery of London, including Il Sarto (The Tailor). There are also a number of museums around the world holding his work.